Again, we have a match up of two highly skilled sides with similar traits as the intermediate final. A team in their first year down a grade looking to go straight back up Roche and the other side have reached another final having being there or there about this past few seasons Finbarrs. This mix in skill and final experience will make for high nerves and pressure hopefully resulting in a really entertaining final. To help matters on that front both teams play an open game of football and rely on their attack to get them through. Both teams also rely on a talisman up front. Mentioned yesterday those men are: Barry O’Hare Roche and William Woods Finbarrs they sit on top of the leaderboard with 6 points separating them. The pressure will be on them to produce the goods. The pressure will actually be more on the management of both sides coming up with a strategy to cope with them. Roche are quite dogged at the back men like Harry O’Connell, Joe bishop and pacy Duane Callan will relish the challenge and on the Togher side the Lenehan brothers and Bryan Sharkey will also be rubbing their hands in anticipation but it’s going to be team effort rather than someone just heroically going one on one. If either side don’t bring at least one extra man back they will be very naive. It will maybe go against both teams attacking ethos but the Christy Bellew will not care how he is won as long as he is won. So with both talismen possibly tied down who will this game possibly break to? Roche heavyweights Daniel O’Connell and the Carthy brothers can do the business while Bernard Osbourne, look out for his impact off the bench, it will be a big factor and Jack Butterly has pounced for trademark punched goals in the lead up to the final for the Togher men at the most opportune times. 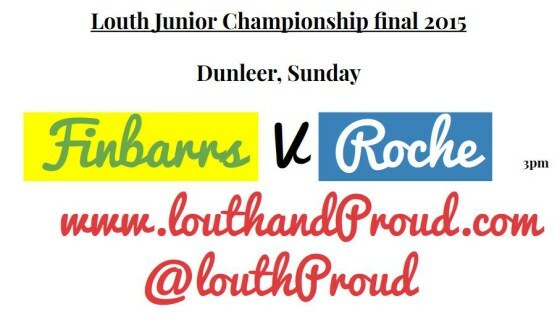 The fact the Finbarrs have scored more goals en route to the final (8 compared to roches 4) is a key indicator to me that the Barrs will have just too much for the Roche. Also The Barrs beat them in the league aswell this year, so knowing that they have the Roche’s number will give them great confidence too. Spare a thought for Darren McConnon who has the unenviable task of facing his former club in a final! Imagine doing that!? It won’t be easy for the former Roche midfielder but he’s a good enough player to deal with it. send in your verdicts here!